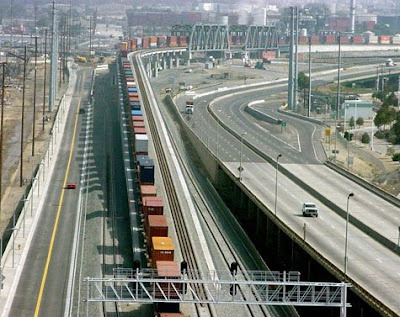 The Alameda Corridor is a 20-mile-long rail cargo expressway linking the ports of Long Beach and Los Angeles to the transcontinental rail network near downtown Los Angeles. It is a series of bridges, underpasses, overpasses and street improvements that separate freight trains from street traffic and passenger trains, facilitating a more efficient transportation network. Chances are that a lot of the stuff around you right now made its way through the Alameda Corridor.